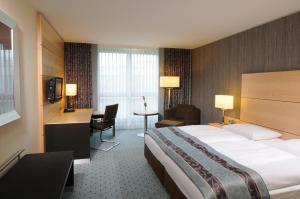 All of the stylish rooms and suites at the Maritim Hotel Düsseldorf feature soundproofed windows and flat-screen TVs. The modern bathrooms include high-quality toiletries, bathrobes and a hairdryer. 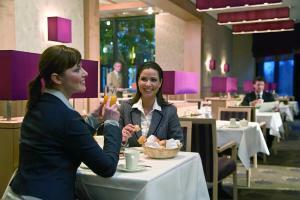 The Maritim Düsseldorf serves Mediterranean cuisine in the Bottaccio bistro, traditional Rhineland food in the Rheinische Stov lounge, and sushi in the SushiSho restaurant. There are also 2 bars. The A44 motorway is just 500 metres from the Maritim, and Düsseldorf Exhibition Centre is a 10-minute drive away. The S-Bahn (city rail) at Düsseldorf Airport links to Düsseldorf city centre in just 10 minutes. Please note the following costs for early check-ins and late check-outs: There will be a fee of € 39 for an early check-in at 10:00, € 19 for an early check-in at 12:00. A late check-out after 12:00 will be € 10 per hour until 18:00 the latest.